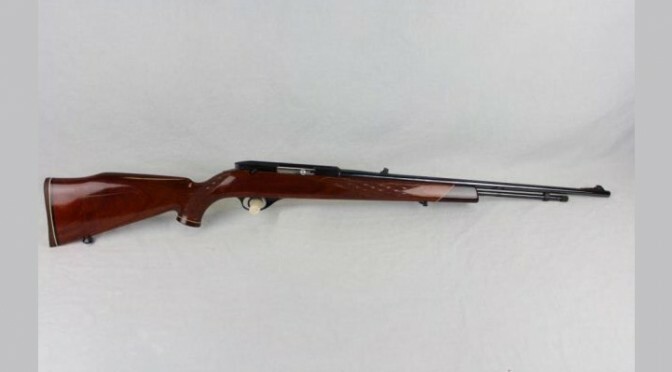 If you're aiming to add to your gun collection or want to find the perfect piece with which to start one, the firearms auction at Oglesby and Company Auctioneers in Winter Haven, Fla., and online at iCollector.com should be your target. With more than 100 firearms up for bid, along with a large selection of firearm parts and accessories, the first session of the auction, which will begin Sept. 7 at 10 a.m., will offer gun enthusiasts with a large cache of options from some of the biggest names in the industry, including Smith & Wesson and Mossberg. Among the many highlights up for bid are some true classics. 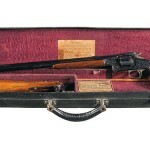 Two models made in 1873 – a US Springfield Carbine rifle with a 22" barrel, still in beautiful condition, and a Winchester rifle with a 24" barrel – are just two of the options available for lovers of 19th century weapons and Americana. If classic revolvers are more your style, you could put an 1892 Colt double-action with a 6" barrel, lanyard ring and original checkered grip in your holster when the live and online auction kicks off this Friday. 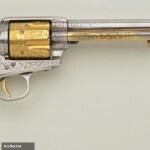 Or maybe you'd be interested in something foreign-made, in which case there is a rare A. Wespe Berne, Belgian-made, French-style revolver from 1874. 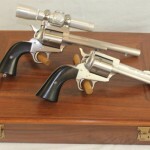 Samuel Colt will be well-represented throughout the auction. 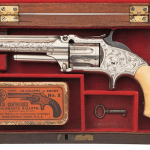 Aside from the 1892 model, there is a double-action revolver marked "U.S. Army Model 1901," with inspector's initials stamped on the bottoms of both grips; a near-perfect New Frontier .22; and a New Navy .38. While the antiques might be the real draw for some, it's the wide-ranging selection that should elicit the biggest interest. There will be high-powered, home protection options like an 18-&frac14;" barrel Mossberg shotgun and a Shandong Model POS with an adjustable-sight barrel and a synthetic stock. Those who are just looking for another hunting rifle will also have their choice of game-stopping options. If you need a starter gun for a friend or family member there's a Stevens 940E with a 28" barrel, a Stoeger Uplander .410 with a 26" barrel and even a couple of Ted Williams models. Along with the vast array of guns, there are also several knives available, including a Hen and Rooster Sheathed Stag Handle Knife and a Damascus Blade Folding Knife. But the biggest catch of the day might be the ready-to-fish 1985 Fisher Marine 16 Bass Boat. 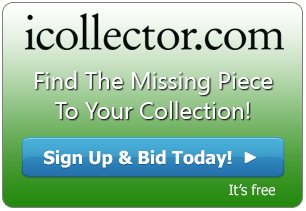 With sales and auctions taking place every day, iCollector.com is the place to find everything from gun auctions to jewelry auctions to movie memorabilia for sale.